Seventy-year-old Kim Byeongsu is living in a nightmare. The only problem is that he cannot remember anything. You see, the central character and narrator in Young-ha Kim’s titular short story, “Diary of a Murderer,” is a serial killer with a particularly nasty case of Alzheimer’s. Complicating matters for Mr. Kim is the fact that his village, which sits near the border with North Korea, is suffering from another serial killer—a fiend that Mr. Kim, who quit murdering 20 years before the story begins, outs as a local real estate agent named Pak Jutae. This younger killer has designs on Eunhui, the young girl that Mr. Kim adopted from his last victim. Diary of a Murderer and Other Stories is a brilliant collection of short stories that run the gamut from intense thrillers to introspective reflections on pain. In “The Origin of Life,” medical supply worker Seojin tries to get back with his lost love, Ina. Unfortunately, Ina is a double victim of an abusive husband and a jealous stalker. After tragedy befalls Ina and the husband and stalker both wind up incapacitated, Seojin, who is initially described as an ordinary, if not somewhat wistful, looks into the eyes of the badly wounded husband and says: “you’ll spend the rest of your life like this . . . But guess what? I’m alive, I survived. And I love it.” The raw emotion of this concluding scene turns a tragic love story into a realistic examination of the primordial survival instinct. The book’s other two stories, “Missing Child” and “The Writer,” add pathos to any already emotionally charged collection. In “Missing Child,” depressed couple Yunseok and Mira are reunited with their child years after his abduction by a suicidal woman. After spending his life and money on missing persons flyers for his lost son, Yunseok is crestfallen when Seongmin (renamed Jonghyeok by the kidnapper) turns out to be distant and aloof to his biological family. Even worse, Seongmin grieves openly for the woman who abducted him. As for Mira, her terrible schizophrenia causes her to deny her son repeatedly. “Missing Child” does have a somewhat happy ending, but it basically argues that some things cannot be healed, forgotten, or overcome. They are, sadly, doomed to bleed continuously like an undressed wound. “The Writer” is the weirdest story in the batch, as it concerns a struggling novelist who finds inspiration in the sexual vigor of his new editor’s wife. “The Writer” is simultaneously about writer’s block and infidelity. It ends in a most surreal way. 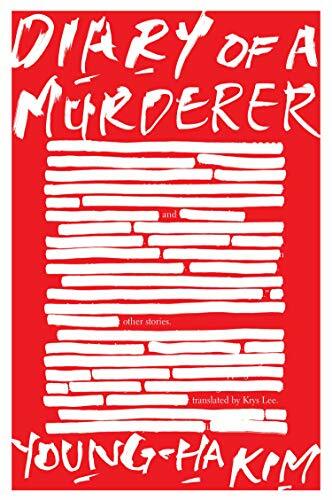 Diary of a Murderer and Other Stories is visceral gut punch of a collection that mostly takes place within the troubled minds of its protagonists. Young-ha Kim is exceedingly good at distorting reality and telling stories about how meaningless reality truly is. This is everyday surrealism with a sharp edge. In this collection, serial killers are sympathetic and traumatized children are spoiled brats who heartlessly traumatize two generations, one older and one younger. As bleak as this collection is, a bright ray of light shines through. That ray is called “talent,” and Young-ha Kim is an author who deserves to be very famous.